View inside the enclosure of our Rigaku XtaLAB Synergy diffractometer. The Department of Chemistry and Chemical Biology’s X-ray Diffraction Facility offers single-crystal X-ray diffraction services to members of the Cornell campus and other researchers throughout the region. Our goal is to provide crystal structure analysis of small molecules (organic, inorganic, organometallic and coordination compounds) and to instruct students, faculty and other users in the collection and interpretation of X-ray diffraction data. 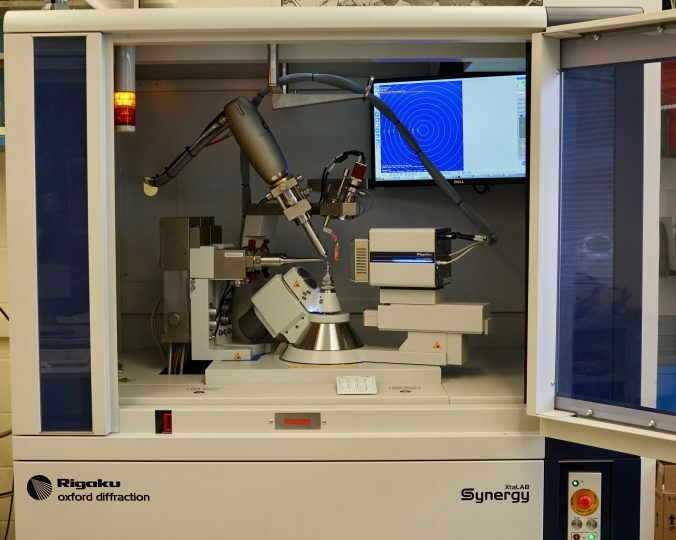 Our facility maintains a Rigaku XtaLAB Synergy diffractometer, equipped with a 4-circle Kappa goniometer, dual microfocus X-ray sources (Mo/Cu), a HyPix-6000HE Hybrid Photon Counting (HPC) detector and an Oxford Cryosystems 800 Series Cryostream. The combination of these high-flux sources with the high sensitivity and zero background noise of the HPC detector has made it possible for us to collect data for very small crystals and even protein crystals. We also house a Bruker X8 APEX II diffractometer, equipped with a 4-circle Kappa goniometer, a 3 kW Mo sealed-tube, an APEX II charge-coupled device (CCD) detector and an Oxford Cryosystems 600 Series Cryostream. We are capable of handling air- and moisture-sensitive samples and welcome any and all challenges. Additional equipment include a Nikon Stereoscopic Zoom Microscope with polarizing attachments, as well as an extra PC workstation with access to the Cambridge Structural Database and the complete suite of Rigaku OD CrysAlisPro and Bruker AXS software for data processing, structure solution, refinement and report production. Multiple other software for crystallographic research are also available on the workstation. Users from outside Cornell interested in using the facility should contact Sam MacMillan.